There are several dental situations where a crown is the best solution. Because a crown is a larger investment, many patients want to understand why a crown is needed, rather than a simple filling or other treatment. The main reason your dentist may suggest a crown over a filling to repair a tooth comes down to the size of the damage or concern. Fillings patch or rebuild teeth and only cover a small portion of the tooth surface. 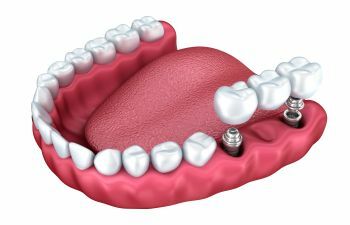 However, crowns are used to cover the entire surface and replace the function of the natural tooth underneath. Large decayed area that tends to have significant amounts of food pack down into it after each meal. Pressure, sensitivity or pain in a tooth that may indicate that the structure of the tooth is probably compromised to the point where it cannot functionally withstand use without being crowned. More than half of your tooth is broken off and visibly gone. Severe fracturing won’t hold a filling in place, and if a filling is attempted it can continue to fall off. If your dentist says you need a crown, don’t worry. The procedure is straightforward and the results are natural. The ideal dental crown will mirror the image of the tooth on the opposite side of the mouth – in size, shape, contour and color. An impression will be taken of your entire mouth, so that the tooth can be fabricated to complete your smile rather than just fill in a space. Your dentist will make sure the crown not only looks natural and aesthetically pleasing, but that it functions well too. Your crown needs to support an accurate, comfortable bite. A dentist can adjust any minor discrepancies or discomfort.